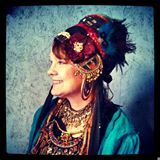 Elizabeth Markley (Artemisia) is an experienced belly dance instructor and promoter in the Midtown Tulsa Area. She has studied belly dance with David of Scandinavia, Deborah Oldham of Tulsa and Sayroya Al Musri of Oklahoma City. Artemisia has taken many workshops with such noted belly dance instructors as Michelle Joyce, Princess Farhana, David of Scandinavia, Ruby Beh, Amanda Rose, Ava Fleming, and Sa'diyya , just to name a few. Artemisia believes that a belly dancer remains a student forever in their journey in dance and should always be learning . Therefore as a belly dance promoter she brings many notable belly dancer instructors to the Tulsa area. Artemisia teaches Belly Dance to the beginner as well as the experienced dancer in the Midtown Tulsa Area. The classes are held at the That's Dancing Studio 4427 East 31st For information call 918-851-2192 or email emarkley@cox.net.